In the cold back rooms of his 1927 chocolate factory, Phil Buffamonte has a machine that can press cherry sugar goo into lollipop rounds and an old wooden conveyor that can make row after row of raspberry creme hearts. So it made him sigh to think that more than any of the other confections he has mastered, it is the simple crunchy sponge sugar rising in plain metal pans that people want most for Valentine's Day. And Mother's Day. And Christmas. 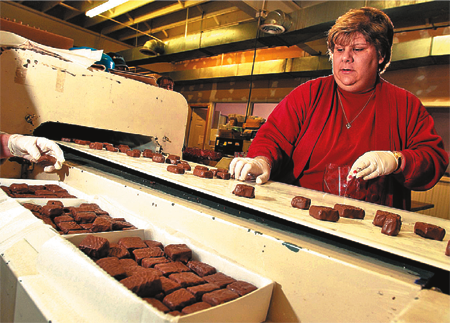 "We spend more than half our time making sponge candy," said Buffamonte, owner of Parkside Candy Co., from his factory office on Main Street in Buffalo. "It almost would be nice to make something else." The candy company he bought in 1979 from the Kaiser family who founded it, uses some 100,000 pounds of chocolate a year to satisfy local customers whose cravings for chocolate covered sponge, caramels and cremes, keep an unusual array of local chocolatiers in business. "We're overcrowded, actually," said Buffamonte. A candy-making trade group reports it has more than a dozen Western New York members when four might be the norm for a metropolitan region this size. Not long ago a conference was held here because visiting sweet makers could tour 10 local plants in two days. "We have a hugely inflated number of members in the Buffalo area compared to other areas," said Van Villington, executive director of Retail Confectioners International in Illinois. A wholesale vendor of chocolate blocks says he sells about 11/2 million pounds a year in Western New York. Why so many chocolate-making clients? He speculated that it was Buffalo's old European immigrant stock. "The Polish and Germans were always very heavy chocolate eaters," said Joe Alfieri, of the West Seneca distributor Nut-Tos & Co., who had to get off the phone because this time of year he is too busy with chocolate to talk much. His buyers, who melt the blocks and blend them to make turtles and cover sponge, say they do well for two reasons. First, there is Western New York's big appetite -- cultivated for decades by chocolatiers making unique local concoctions that include sponge and orange chocolate. Second, it helps to find an overlooked chocolate niche. While Buffamonte has seven chocolate shops in area malls, he has branched out to the amusement park candy trade of saltwater taffy, lollipops and fudge when demand for chocolate dips in the summer. The Choco-Logo factory downtown has a new Broadway shop, but most of its business is in selling private label chocolate bars wholesale to Bloomingdales, Saks and Kenneth Cole shoe stores. The newly rising popularity of gourmet and dark chocolate, now lauded for its health benefits, has been helping sales lately. "We're getting these people who really have a craving," said owner Dan Johnson, whose innovation is sprinkling organic French pond salt on his bars and turtles. The Family Chocolate Shoppe in Clarence, which sells traditional chocolate pieces, has found an extra niche, too. While owner Bruce Fowler left the Fowler's chocolate company after it was sold out of bankruptcy a decade ago, he now makes specially labeled chocolate bars for banks and weddings. Car dealers buy mugs his company engraves and fills with sponge candy for customer gifts. "To survive in this market, you have to do something that's a little bit different," said Fowler. He remembers when his father first speculated on the promise of sponge candy. Fowler picked up him and another chocolatier at the airport after a trade show where they first got the recipe they shared, sometime in the 1940s or 1950s. "If we made this in smaller pieces, we'd really have something," Fowler heard his dad say. "Without sponge candy," said Fowler now, "we would probably close the door." For Watson's Chocolates, sponge is the top seller out of the 150 kinds the company makes. It used to be that the original shop, next to the family's restaurant on Delaware Avenue in Kenmore, opened to sell chocolate only during the chocolate holidays of Valentine's Day and Easter. In 1987, Jim Watson, son of the founding couple, decided to drop the restaurant and develop the chocolate. In 1996, he moved into a new factory in a Town of Tonawanda industrial park. He has been expanding his business by selling by catalog and franchising four of the eight Watson's chocolate shops from Ellicottville to Buffalo to Rochester. The extra exposure from the shops works like an ad and helps sell more chocolate, said Watson. His company also makes custom-designed boxes that businesses, such as the casinos, use as corporate gifts. The trade in chocolate gifts that companies give clients has been a boon to local chocolate makers as other business tokens, such as liquor and cigarettes, have fallen out of favor, he said. "It's a reasonable gift." Chocolate, he said, has now become to the Buffalo-area what coffee is to Seattle. "It is part of our culture," he said. "We can never quite make enough of what we sell." This year it helps chocolate sellers that Feb. 14 falls on a Tuesday. People do their Valentine buying on the 13th and 14th. They seem to shop less when one of the two days is on Sunday, a traditional stay-home day. By Saturday, Watson theorized, people tend to replace chocolate with dinner out. "When Valentine's falls on Friday, it's the ultimate," he said. This year Watson expects lines to the shop doors. He and his daughter Whitney Beecher, who is vice president, will pitch in by writing names on plain chocolate hearts. At Fowler Chocolate's factory in a Buffalo industrial park, owner Ted Marks is bracing for a similar crush of business. "It's a very short and concentrated holiday, and it's challenging because of that," he said. For the occasion, he sells chocolate-dipped strawberries by the dozen and goes through several thousand. Even so, it is sponge candy that is a mainstay for him, too. One morning last week when Marks started his work day, there were 30 Internet orders waiting. Many come in from Western New York expatriates. Most want sponge candy in their chocolate orders. After he spoke, a clerk at the front desk could be heard on the phone helping a caller who seemed to have dialed the right number. "You bite into it, but it melts in your mouth," she said. "Is that what you're looking for?"